This is our first edition of a monthly newsletter that will feature product highlights, ideas and insights into commercial painting applications aimed at making your lives and jobs easier! We are excited to launch our new and updated website that features past jobs, references and our services available. With the ever growing accessibility of e-mail and web browsing, our team has decided to put together this monthly newsletter to provide quality information directly to your inbox each month. We are well aware of the excessive amounts of SPAM received every day, let alone month and are committed to keeping our newsletters short and to the point. For those items in your budget that you know you need to handle this year, we suggest getting them bid early so that you know the cost and time associated. We are happy to help you get a jump start on any bids no matter how big or small. Preferred Painting is committed to being accessible, easy to reach and quick to respond. Keep the common areas of your building looking great! 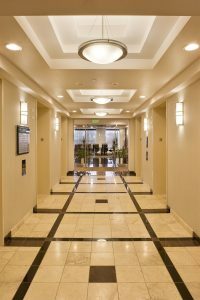 Our experience in common area maintenance is extensive ranging from large open areas with high ceilings to elevator coatings. Maintaining a clean and attractive common area is important to keeping both your current and future tenants happy. Also, we will work nights, weekends and other times to ensure there is no interference with business as usual. We can handle all needs when it comes to tenant finish, both small and large. Whether it is a repaint of a suite, drywall repair or water damage; we respond quickly and efficiently. We guarantee the highest quality and satisfaction on each and every job. Next StorySummer is officially here!